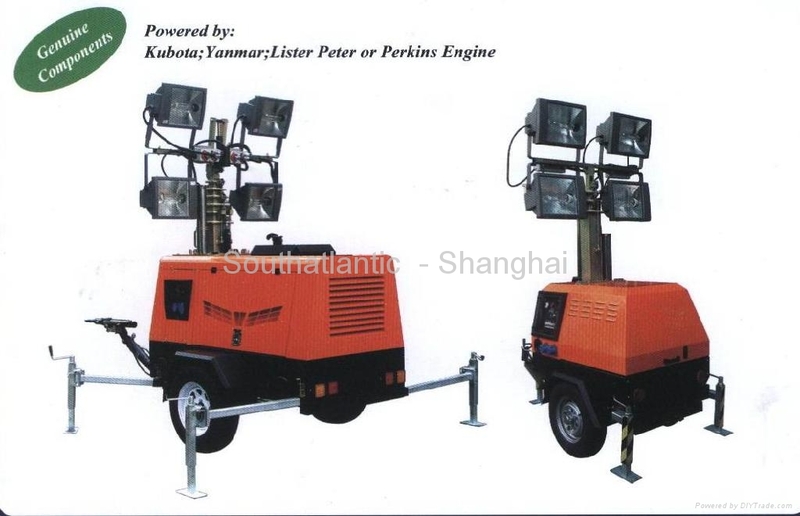 1.KUBOTA,YANMAR OR PEKINS Engine for reliable operation and long service life. 3. the illuminating angle of the light bar can be manually or automatically adjusted. 4. Automatic shutdown protection is provided against low oil presssure and high engine temperature. A control panel with key start/Stop provides and operator with easy access to all controls. 5. Plug-in electrical componets with Mil-Spec connectionsl for easy replancements by unskilled operators. Individual lighting circuits allow replacement of componets without interrupting on-site illumination. 6. Rugged floodlight housing with end -lamp support, high performance aluminium reflectors and tempered lenses. Floodlights can be mounted on the cross bar for travelling. 7. Heavy-duty tubular steel trailer frame and weather proof/acoustic enclosure applied wit automative(5 cost+Iron phosphate pre-treatment)corrosion resistian coastings. 9. Single-point lifting eye and tie-down rings ensure safe and balanced positioning and transport.